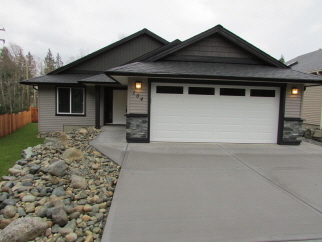 Beautifully built 3 Bedroom/2 Bath Rancher located on a quiet park like lot in the popular Holland Creek Estates. Approx. 1466 sqft, offering a spacious and light filled open concept living space with vaulted ceilings in living room and electric fireplace framed by rock. Large and generous well-appointed kitchen provides a grand island and 6’x4’ walk-in pantry. Master suite boasts a full 4-piece ensuite with a 5’x8’ walk-in closet. 425 sq.ft. double garage with key pad and driveway is level. Yard is fully landscaped and fenced. Other outstanding features this home offers is: full appliance package, built in vacuum with kick sweeper, all closets and pantry are fully shelved, full window blind package and alarm system.